16945 ft (5165 m) Highest point in Turkey . 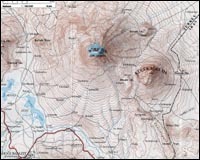 Volcanic Status: Active, minor eruption 1840? 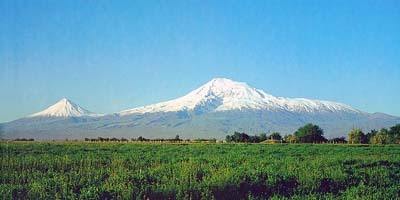 Ararat is one of the most famous mountains in the world, not because of its stature as one of the world's great stratovolcanoes but because it is the legendary resting place of Noah's Ark. 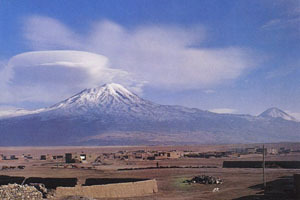 Yet Ararat is truly a magnificent mountain, with two separate cones which dominate the view throughout the northeastern part of Turkey and also much of Armenia and portions of northwestern Iran. 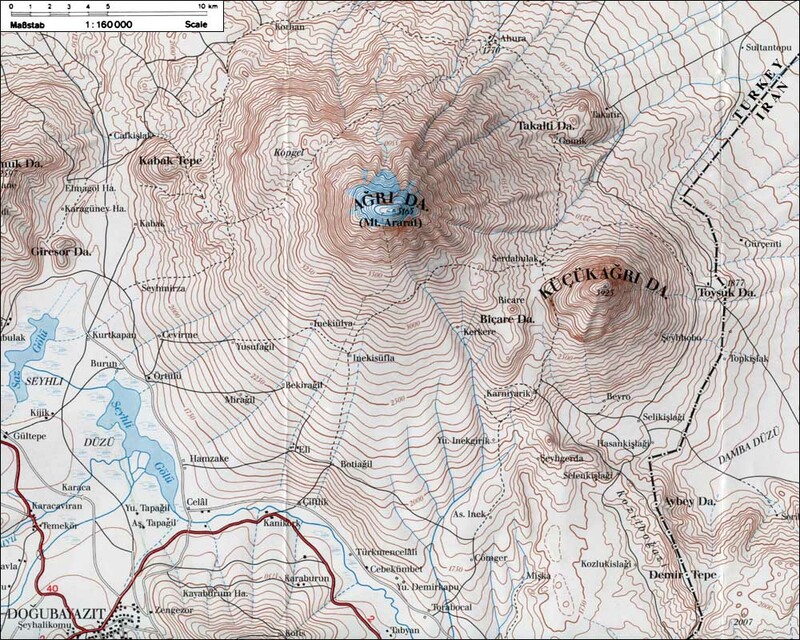 The main cone of Ararat (Great Ararat, or Buyuk Agri Dagi in Turkish) supports a large summit icecap with an area of about 4 square miles (10 sq km), plus a single large valley glacier within the Ahora Gorge, a deep gash in the north face formed by an ancient landslide. 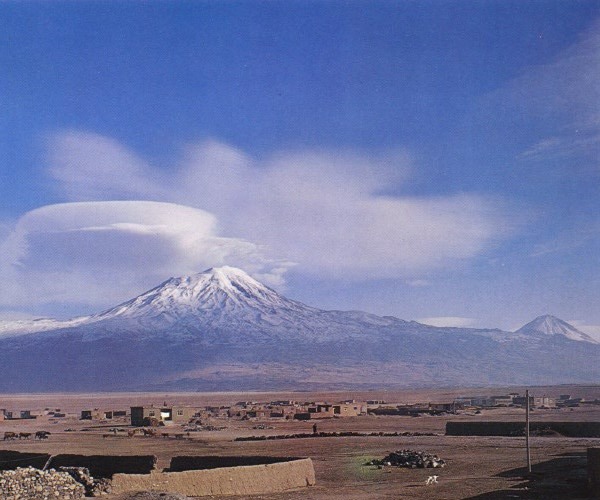 The almost perfectly symmetrical cone of Little Ararat (Kucuk Agri Dagi in Turkish) is a sizable stratovolcano in its own right, rising more than 4000 ft (1200 m) above the saddle separating from its big brother about 7 miles (11 km) to the WNW. Winter snows often accumulate to well below this saddle, and even sometimes as low as Dogubayazit at 5600 ft (1700 m), providing numerous possibilities for spectacular and lengthy ski descents. 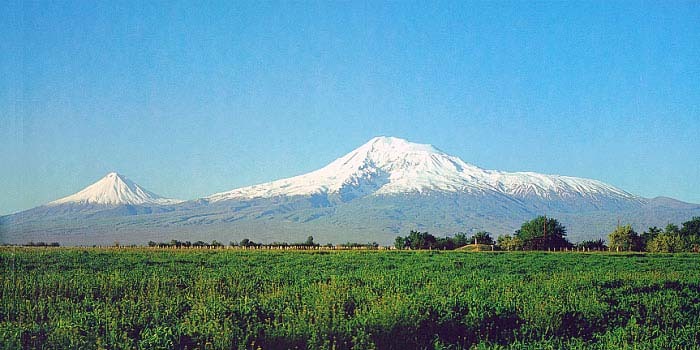 Unfortunately, Ararat's location in a sensitive border area makes it the only Turkish volcano with a lot of bureaucratic red tape for climbing or skiing trips (in fact the Iranian border crosses the eastern slopes of Little Ararat at an elevation of over 6000 ft / 1800 m).